Nonyelum Ekwempu (Nigeria) for ‘American Dream’, published in Red Rock Review (2016), and republished in The Anthem. Nonyelum is a Nigerian writer and visual artist. She grew up in the bustling city of Lagos and in small villages in southwestern and southeastern Nigeria. Her art is inspired by jazz, the African immigrant experience, and the colours and vibrancy of various African cultures. She is currently a medical student at Loyola University Chicago Stritch School of Medicine. Stacy Hardy (South Africa) for ‘Involution’, published in Migrations: New Short Fiction from Africa, co-published by Short Story Day Africa and New Internationalist (2017). 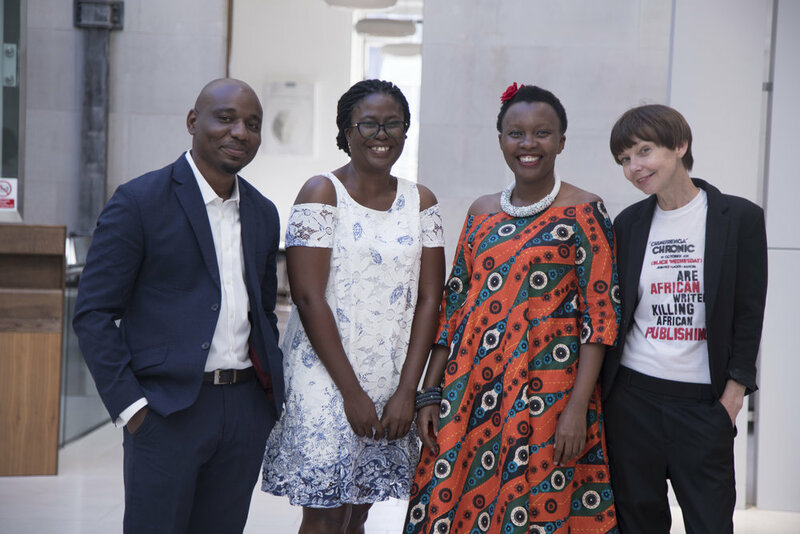 Stacy Hardy is a writer and an editor at the pan African journal Chimurenga, a founder of Black Ghost Books, and a teacher at Rhodes University, South Africa. Her writing has appeared in a wide range of publications, including Pocko Times, Ctheory, Bengal Lights, Evergreen Review, Drunken Boat, Joyland, Black Sun Lit, and New Orleans Review. A collection of her short fiction, Because the Night, was published by Pocko Books in 2015. She is currently finalising a second collection to be published in 2019, and is also working on a novella. Olufunke Ogundimu (Nigeria) for ‘The Armed Letter Writers’, published in The African Literary Hustle (2017). Olufunke Ogundimu was born in Lagos, Nigeria. She has an MFA from the University of Nevada, Las Vegas. Her work has been published in Dream Chasers, Nothing to See Here, Red Rock Review, New Orleans Review, and Transition Magazine. She is working on a short story collection reluctantly titled The Was Thing, and a historical novel set in the twelfth-century Oyo Kingdom, titled Memories of Three Rivers. Makena Onjerika (Kenya) for ‘Fanta Blackcurrant’, published in Wasafiri (2017).Makena is a graduate of the MFA Creative Writing programme at New York University, and has been published in Urban Confustions and Wasafiri. She lives in Nairobi, Kenya, and is currently working on a fantasy novel. Wole Talabi (Nigeria) for ‘Wednesday’s Story’, published in Lightspeed Magazine (2016). Wole is a Nigerian full-time engineer, part-time writer and some-time editor with a fondness for science fiction and fantasy. His stories have appeared in publications including Terraform, Omenana, Liquid Imagination, and The Kalahari Review. He edited These Words Expose Us, the anthology of Nigerian blog-site, The Naked Convos. He currently lives and works in Kuala Lumpur, Malaysia. He enjoys good stories and goes scuba diving whenever he gets the chance. Lesley Nneka Arimah (Nigeria) for 'Who Will Greet You At Home' published in The New Yorker (USA. 2015). Lesley Nneka Arimah is the author of What It Means When A Man Falls from the Sky, a collection of stories published by Riverhead Books (US) and Tinder Press (UK), 2017. Her work has appeared in The New Yorker, Harper's, Per Contra and other publications. Lesley was shortlisted for the Caine Prize for African Writing in 2016 and was a participant in the Caine Prize 2017 workshop in Tanzania. Chikodili Emelumadu (Nigeria) for ‘Bush Baby' published in African Monsters, edited by Margaret Helgadottir and Jo Thomas (Fox Spirit Books, UK. 2015). Chikodili's work has appeared in One Throne, Omenana, Apex, Eclectica, Luna Station Quarterly and the interactive fiction magazine, Sub-Q. In 2014, Chikodili was nominated for a Shirley Jackson award and is working on her novel. Bushra al-Fadil (Sudan) for 'The Story of the Girl whose Birds Flew Away' translated by Max Shmookler with support from Najlaa Osman Eltom, published in The Book of Khartoum - A City in Short Fiction edited by Raph Cormack & Max Shmookler (Comma Press, UK. 2016). Bushra has published four collections of short stories in Arabic. His most recent collection Above a City's Sky was published in 2012, the same year Bushra won the Altayeb Salih Short Story Award. Bushra holds a PhD in Russian language and literature. Arinze Ifeakandu (Nigeria) for 'God's Children Are Little Broken Things' published in A Public Space 24 (A Public Space Literary Projects, Inc., USA. 2016). Arinze was the editor of The Muse (No. 44) at the University of Nigeria, Nsukka where he studied English and literature, graduating in 2016. In 2013, Arinze attended the Farafina Trust Creative Writing workshop and was shortlisted for the BN Poetry Prize in 2015. Arinze was a 2015 Emerging Writer fellow of A Public Space magazine, where his short story was published. Magogodi oaMphela Makhene (South Africa) for 'The Virus’ published in The Harvard Review 49 (Houghton Library Harvard University, USA. 2016). Magogodi's work has appeared in Ploughshares and Elie Wiesel's An Ethical Compass, and has been recognised by the NYU Reynolds Program for Social Entrepreneurship, the Elie Wiesel Foundation for Humanity and the Truman Capote Fellowship at the Iowa Writers' Workshop, where she earned her MFA. Magogodi is a recipient of the David Relin Prize for Fiction and is currently working on a collection of interwoven stories exploring the inner lives and loves of ordinary South Africans. She is a proudly Soweto-made soul. In 2017, Tope's story was translated in Kiswahili after the Prize's workshop in Tanzania. Read Mwanzo translated by NS Koenings. Lidudumalingani (South Africa) for ‘Memories we Lost’ published in Incredible Journey: Stories That Move You (Burnet Media, South Africa, 2015). Lidudumalingani is a writer, filmmaker and photographer. He was born in the Eastern Cape province of South Africa, in a village called Zikhovane. Lidudumalingani has published short stories, non-fiction and criticism in various publications. His films have been screened at various film festivals. In 2017, an extract from Lidudumalingani's story was translated in Kiswahili after the Prize's workshop in Tanzania. Read Kumbukumbu Tulizopoteza translated by Elias Mutani. Lesley Nneka Arimah (Nigeria) for ‘What it Means When a Man Falls From the Sky’ published in Catapult (Catapult, USA, 2015). Lesley Nneka Arimah is a Nigerian writer living in Minneapolis. Her work has appeared in The New Yorker, Harper’s and other publications. When she isn't spreading peace and joy on Twitter, Arimah is at work on a collection of short stories (What it Means When a Man Falls From the Sky) forthcoming in 2017 from Riverhead Books. There are rumours about a novel. In 2017, an extract from Lesley's story was translated in Kiswahili after the Prize's workshop in Tanzania. Read Maana ya Mtu Kuanguka kutoka Juu translated by Elias Mutani. Bongani Kona (Zimbabwe) for ‘At your Requiem’ published in Incredible Journey: Stories That Move You (Burnet Media, South Africa, 2015). Bongani Kona is a freelance writer and contributing editor of Chimurenga. His writing has appeared in Mail & Guardian, Rolling Stone (South Africa), Sunday Times and other publications and websites. He is also enrolled as a Masters student in the Creative Writing department at the University of Cape Town. In 2017, an extract from Bongani's story was translated in Kiswahili after the Prize's workshop in Tanzania. Read Inaanzia wapi translated by Richard Mabala. Abdul Adan (Somalia/Kenya) for ‘The Lifebloom Gift’ published in The Gonjon Pin and Other Stories: The Caine Prize for African Writing 2014 (New Internationalist, United Kingdom, 2014). His work has appeared in African magazines Kwani, Jungle Jim, Gambit, Okike, Storytime, SCARF and elsewhere. He was a participant in the 2014 Caine Prize workshop in Zimbabwe, and is a founding member of the Jalada collective. In 2017, an extract from Abdul's story was translated in Kiswahili after the Prize's workshop in Tanzania. Read Zawadi ya Mchanuliamaisha translated by Richard Mabala. 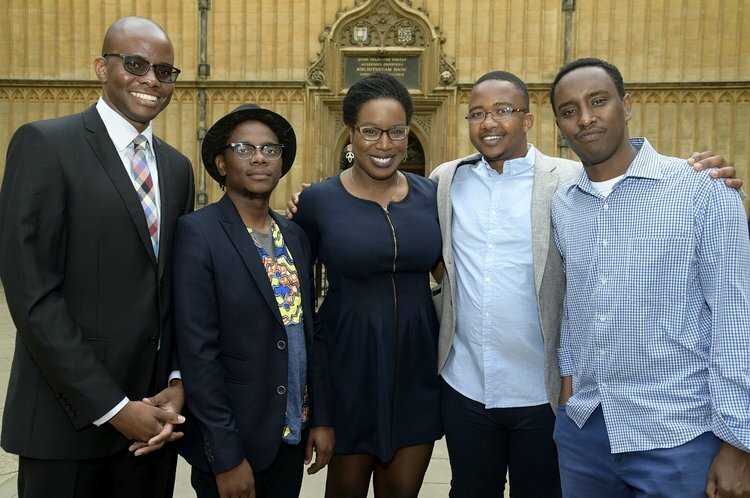 Masande Ntshanga (South Africa) shortlisted story 'Space in Twenty in 20' published in Times Media (South Africa, 2014). Masande is the winner of the 2013 PEN International New Voices Award. He was born in East London in 1986 and grew up between Mdantsane, Zeleni, Bhisho, King William's Town, Estcourt, Pietermaritzburg and Cape Town. He graduated with a degree in Film and Media and an Honours degree in English Studies from UCT, where he became a creative writing fellow, completing his Masters in Creative Writing under the Mellon Mays Foundation. He received a Fulbright Award and an NRF Freestanding Masters scholarship. His debut novel, The Reactive, was published in 2014 by Penguin Random House. F.T. Kola (South Africa) shortlisted story 'A Party for the Colonel' published in One Story, Inc. (Brooklyn, New York City, 2014). F.T. Kola was born in South Africa, grew up in Australia, and lived in London and New York City before pursuing an MFA at the Michener Center for Writers at the University of Texas, Austin, where she is a fellow in fiction. 'A Party For The Colonel' is her first published story. Elnathan John (Nigeria) shortlisted story 'Flying' published in Per Contra (International, 2014). Elnathan is a full time writer who lives and works in Nigeria. His writing has been published in Per Contra, ZAM Magazine, Hazlitt, Evergreen Review, and Chimurenga's The Chronic. He writes political satire for a Nigerian newspaper and his blog for which he hopes to someday get arrested and famous. He has tried hard, but has never won anything. His first novel is due from Cassava Republic Press in 2015 and Grove Atlantic’s Black Cat in 2016. He is a 2015 Civitella Ranieri fellow. Namwali Serpell (Zambia) won the 2015 Caine Prize for 'The Sack' published in Africa39 (Bloomsbury, London, 2014). Namwali was born in Zambia in 1980. Her first published story, “Muzungu,” was selected for the Best American Short Stories 2009 and shortlisted for the 2010 Caine Prize for African Writing. She received a Rona Jaffe Foundation Writers Award in 2011. In 2014, she was selected as one of the most promising African writers for the Africa 39 Anthology, a project of the Hay festival. Her writing has appeared in Tin House, The Believer, n+1, McSweeney’s (forthcoming), Bidoun, Callaloo, The San Francisco Chronicle, The L.A. Review of Books, and The Guardian. She is an associate professor in the University of California, Berkeley English department; her first book of literary criticism, Seven Modes of Uncertainty, was published in 2014. Según Afolabi (Nigeria) shortlisted story 'The Folded Leaf' published in Wasafiri (Routledge, London, 2014). Según was born in Kaduna, Nigeria, and grew up in Canada, the Congo, Indonesia, Germany and Hong Kong. His first novel, Goodbye Lucille, was published in 2007 and won the Authors’ Club Best First Novel Award in the UK. His first book, A Life Elsewhere, a short story collection, was published in 2006 and was shortlisted for the Commonwealth Writers’ Prize. Afolabi was awarded the Caine Prize for African Writing in 2005 for "Monday Morning". He lives in London.